PSST! We’ve created the Ultimate Elevator Pitch Template & Guide, packed with a step-by-step template & powerful tips you can follow and pull inspiration from. Download it for free here! Elevator pitches condense your idea into 1 minute or less (the amount of time you might have on an elevator- get it!?). They’re useful for a variety of reasons. Whether you’re pitching to investors, looking for potential partners, or simply telling someone about your startup, a concise elevator pitch is essential. It might seem intimidating at first, but it’s totally possible (and actually, necessary if you want to push your idea forward). That's why we created the FREE Ultimate Elevator Pitch Template & Guide, an interactive guide that walks you through every step of creating the perfect elevator pitch. Think of your elevator as a concise way to talk about what you’re working on that leaves the listener wanting more. The purpose of the elevator is to get someone to ask more about your idea, not walk away knowing everything off the bat. a great elevator pitch will change your life. 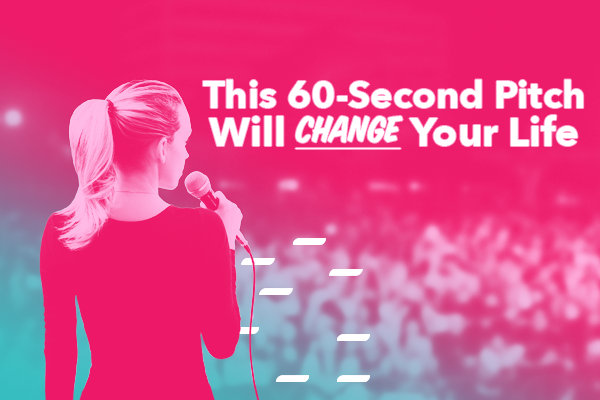 So, just how life changing can a 60-second pitch actually be? To be totally honest with you: it can make or break the success of your startup. You're not just using elevator pitches to get investors, but you're using them to generate interest in your startup, build connections, and find customers. This is how you can really take your networking game to the next level. You've got to be able to talk about your idea in a captivating way and concise way. People won't wait around for you to explain the details later. You've got to catch their attention the first time around. That being said, knowing what not to include is just as important as knowing what should be covered. When you’re working on an idea, you get buried in the weeds of things. Everything seems important to you (and it probably is) but that doesn’t mean it needs to be included in an elevator pitch. You’re taking a high-level approach. Giving just enough detail to give clarity without confusing the listener with not-so-critical information. Remember it will constantly change as your idea does, so don’t get caught up in word-for-word information. Instead, just get comfortable pitching your idea to different audiences. Perfection will only happen when you practice in real-life. So get off your computer, and go pitch! Want more info about making the PERFECT Elevator Pitch? We’ve created the Ultimate Elevator Pitch Guide & Template, packed with a step-by-step template & powerful tips you can follow and pull inspiration from. Download it for free here!